Hair Length: Overall 14", Base Size: 6.5" x 6.5"
This hairpiece perfect for concealing and adding coverage, volume for thinning hair. A monofilament base creates versatility and realism with the look of a natural scalp and hair growth. A terrific choice for women in the early stages of hair loss, and so easy to apply. Use the attached snap toupee clips to slide into your existing hair, snap shut, blend with your own hair and that's it. Made in pure 100% remy human hair, allowing styling and professionally tailoring and styling as you wish, just like your own hair. Lightweight, confident, this topper piece works well with most all hair types. I really love this Hair Pieces. It's made out of human hair, which creates a super natural looking part. And it's very breathable, perfect for this Summer Time. Nice topper. Perfect for summer. Will purchase next pay day! 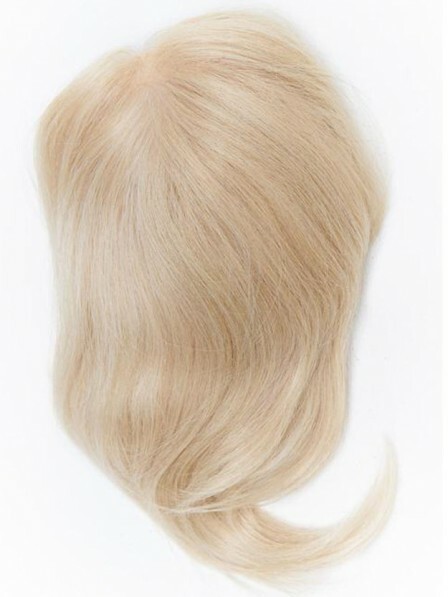 I love the Blonde Mono Top Piece, one the best so far , I have tried many of the rewigs toppers and love them all but for me this is the most natural. I'm so excited to have this Hair Pieces.It covers all my head and fit on my very well. At first, I'm curious about the hair quality. But actually I don't worry about it. I am very happy with this purchase and I definitely think that it was money well spent.The monofilament base is a god send for me.. I do not think anyone in their right mind would question whether or not I am wearing a hair piece (even if they were right up on me). The hair is absolutely amazing, very silky and smooth. Love this topper so much! I feel depressed since I started my hair loss two years ago.ReWigs is my thinning hair remedy. I can always pick the best for me here. Thanks for ReWigs. Blonde Mono Top Piece is my favorite hair topper so far.The monofilament base is very natural and it looks like my own scalp. No one found me wearing a topper.Will order again! I like this Top Piece.I have thin hair and bought many Top Piece from Rewigs. I think this one is great. I like the monofilament base, it's very comfortable. Their toppers are all very nice.They have changed my life and made me feel so much better about myself. Thank you! !